Firewall enviroment, Red and Green network interfaces. Transparent proxy with SSL on Green. Client which rely on filter 1 cannot be accessed via AnyDesk, as was before enabling the transparent proxy. 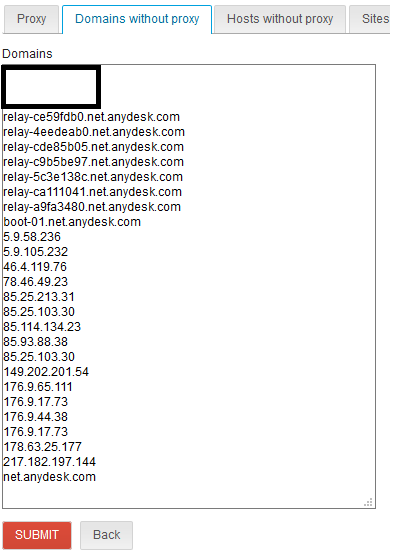 I tried also to allow the IP Addresses associated with Anydesk that i found on the squid access.log. Hope this will help someone. How can i enable webfilter/proxy to allow connection? Anyone managed this kind of issue before? I think you have to bypass it with firewall rules. PS: most posts there are English. Perhaps you could have a look with wireshark or an other network tool if there some more addresses to exclude. ran the river to the sea. Is it possible block we sites using ip address excluded whitelisted ip addresses? If not could this be a feature?